Jen Davis: Using self-portraiture to explore body image (PHOTOS). 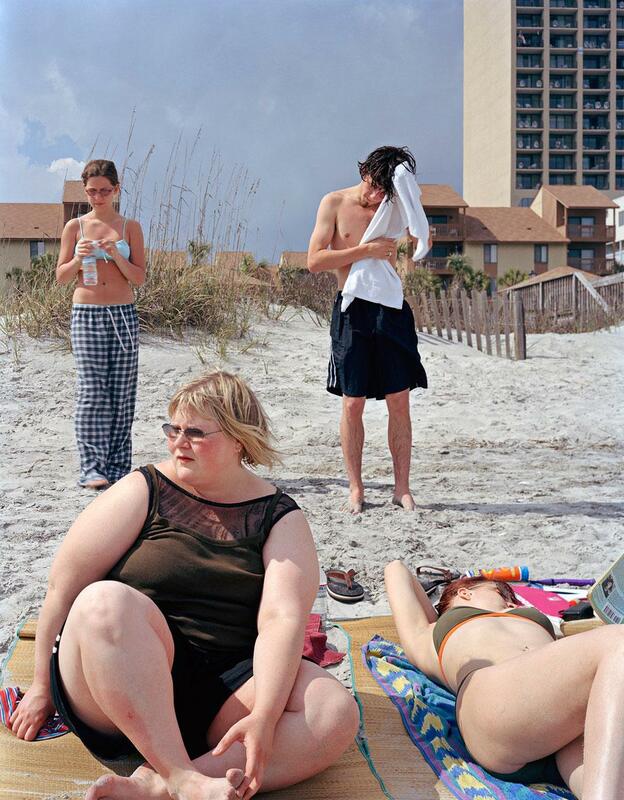 Like a million other college students on spring break, Jen Davis took a picture of herself and her friends while they were hanging out on a beach. When she returned to school and developed the film, the results caught her off guard. The image of Davis, titled Pressure Point, shows her larger, covered body seated on a towel while her thinner friends around her wear bikinis. After that, Davis spent roughly a decade photographing herself, using her camera to shape her own sense of beauty and as a way to develop her vision as a photographer. Much of that work included photographing herself in ordinary situations: eating, relaxing, showering, etc. Her self-portraits also explored a private, fantasy space that were inspired by a sense of longing, though Davis explained that the line between fantasy and reality—especially when using photography as a medium—is easily blurred. “Some of the images are real genuine feelings, and others are things I wanted to experience, and I used the license of the camera. … I wanted to know what it felt like to be held by someone or to be with a man, and the camera allowed me to have that experience,” Davis explained. The image 4 a.m. (2003), for example, was inspired by a lonely return home after a night with friends, many of whom were in relationships. “I came home at 4 a.m. and made that picture at that instance of having that empty, yearning feeling,” she said. Fantasy No. 1 shows a similar experience, though this time with a “fantasy” man present. While she was working on the images, Davis said she never thought about an audience or what it would be like to show the work. When she eventually did start to show it, some of the images were tough for her to share, but the exposure also allowed her to work through that sense of vulnerability and insecurity. “I was able to deal with the emotion and vulnerable state and release it,” she said. But something else happened during the process: She became upset with herself for not changing her body, and showing her work spurred her to take action. “It was kind of shocking, kind of painful to look at myself and to see myself evolving and growing and understanding a deeper sense of myself but my body not being able to change after nine years’ time. I was shocked and thought ‘why can’t I take control of my life?’ and I realized I didn’t want to wake up at 40 and be in this body—I wanted to know what it would be like to be in a different body, and that was a painful realization,” Davis explained. Davis eventually began dating a man and only recently took out her camera in order to document the experience.